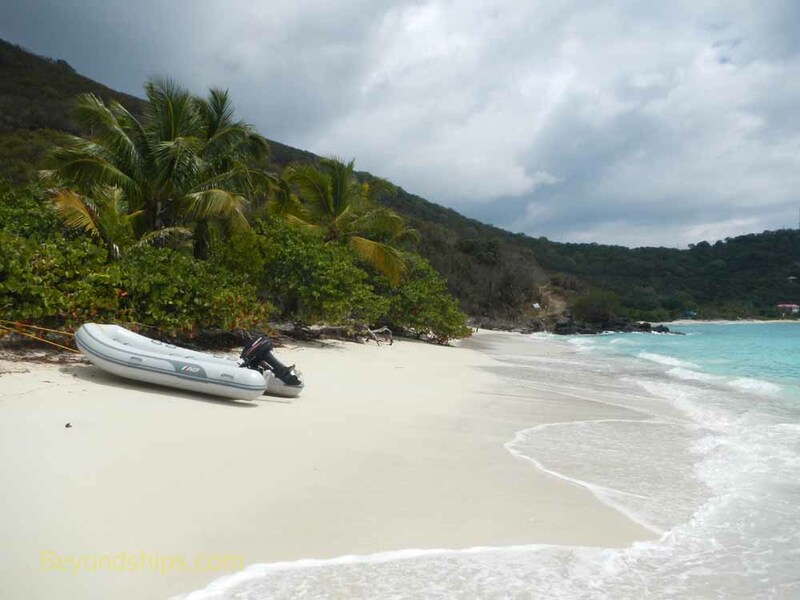 When we arrived at White Bay, Club Med 2 was anchored a short distance from the beach. Although her tender platform was lowered, she did not appear to have begun tender operations to shore. As a result, we had the beach pretty much to ourselves to start. However, during the course of the day a steady stream of small boats and yachts arrived and anchored off shore. Consequently, the beach had a fair number of people by mid-day. 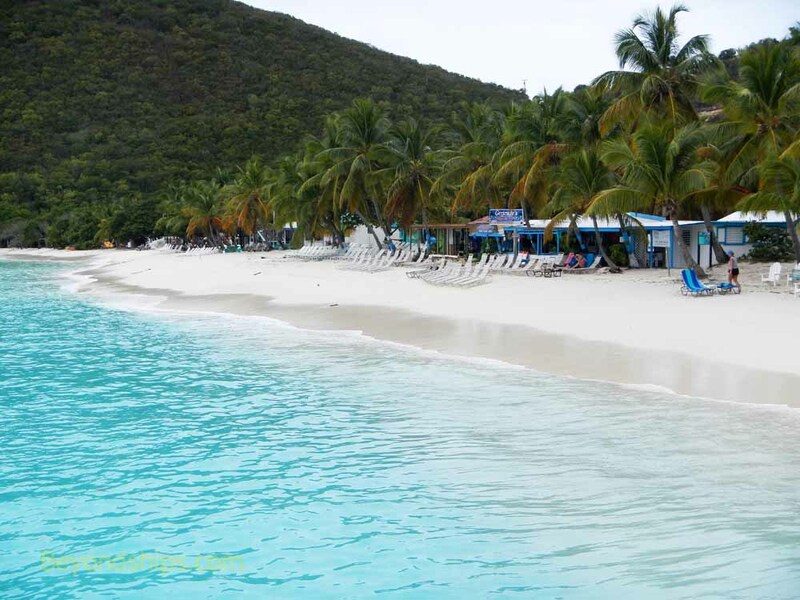 In back of the beach, mixed in with palm trees and other tropical vegetation, are a string of bars and restaurants. This is not an urban residential area with its own population so the customers that support these establishments must be drawn from the people who come to use the beach. One of the locals told me that a thousand people come to this beach on a good day. 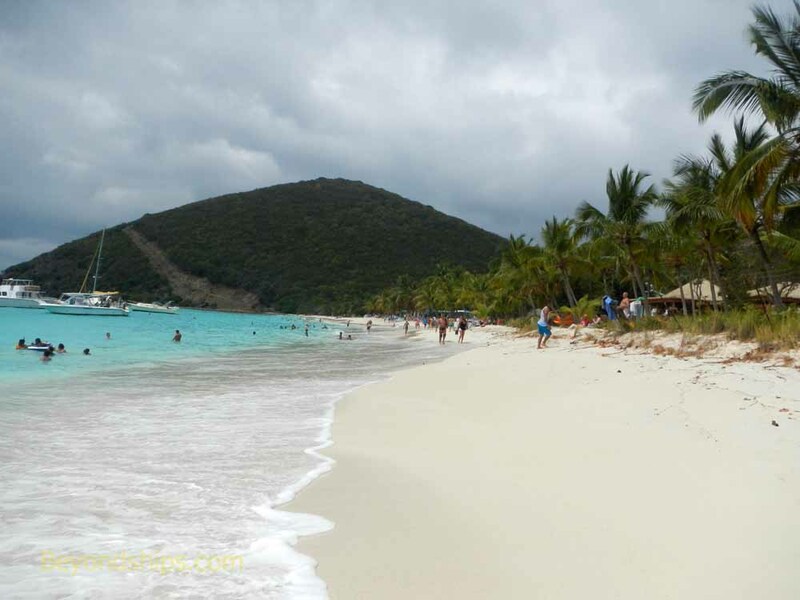 Considering that less then 300 people live on Jost Van Dyke, that is quite an influx of visitors. There is no dock at White Bay. However, we did not have to swim ashore. The captain ran the Rebel Yell up to the beach. A set of steps was then lowered down between the two hulls of the catamaran. Crew members assisted the guests down the steps and into the foot or so of water that covered the bottom of the steps. From there it was a short walk onto the dry beach. 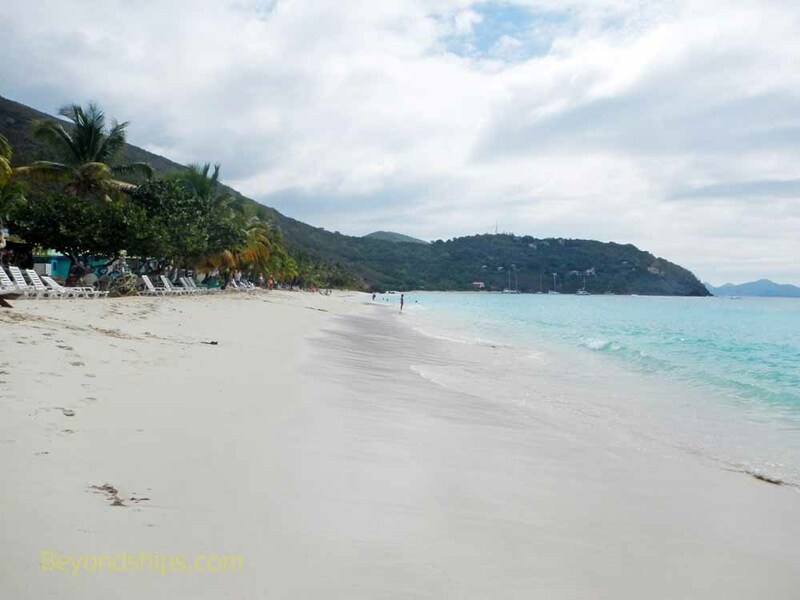 As you would expect from the name, White Bay is a white sand beach. It is a relatively soft sand but not so soft that you would have difficulty walking upon it. The stretch of sand is a fair width, neither small nor large. There is enough room for a few lines of chairs but it is not a vast expanse of desert sand. 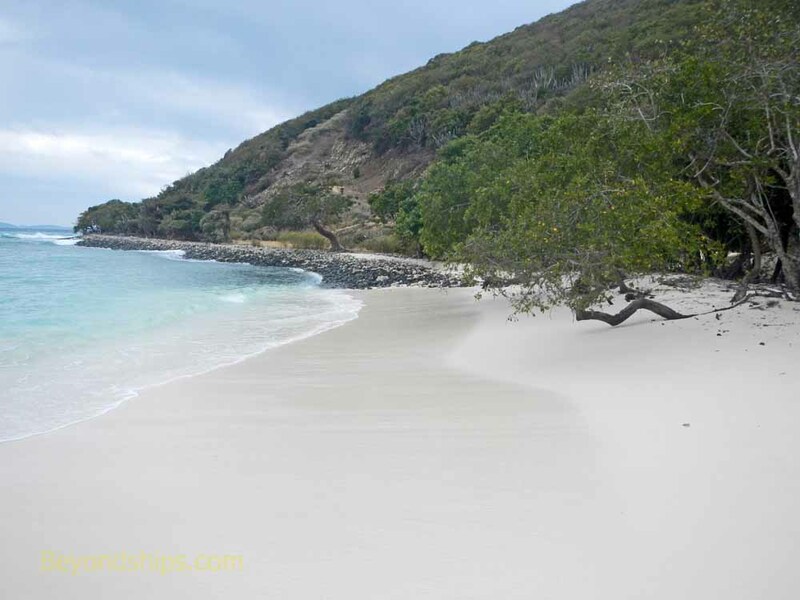 It slopes gently upward from the sea to the line of palms and other vegetation behind the beach. When we were there, most waves lapped at the base of the slope. However, every so often a wave or a series of waves would crash in running most of the way up the slope. This came as something of a surprise to those who had placed their chairs so that the typical wave would just wash over their toes. Like the beach, the seabed is sandy. It drops off quite quickly so that within a few feet from shore, you are swimming rather than standing. A reef one hundred yards off shore protects the beach and provides for snorkeling opportunities. However, the occasional powerful wave can send you body surfing like a crazed otter back towards the beach. Very few people ventured very far from land when we were there. White Bay forms a crescent. However, the beach does not extend all the way along the crescent. Rather, it runs a half mile or so along the center of the slight arch. The middle of this area is where the bars and restaurants are located with the ends more in their natural state. It is a pleasant beach to walk. Even on a mostly cloudy day, the water appears turquoise. Pelicans swoop in after fish. Off in the near distance are St. John and Tortola rising blue and violet out of the sea. Looking towards land, the area still has a largely undeveloped look. 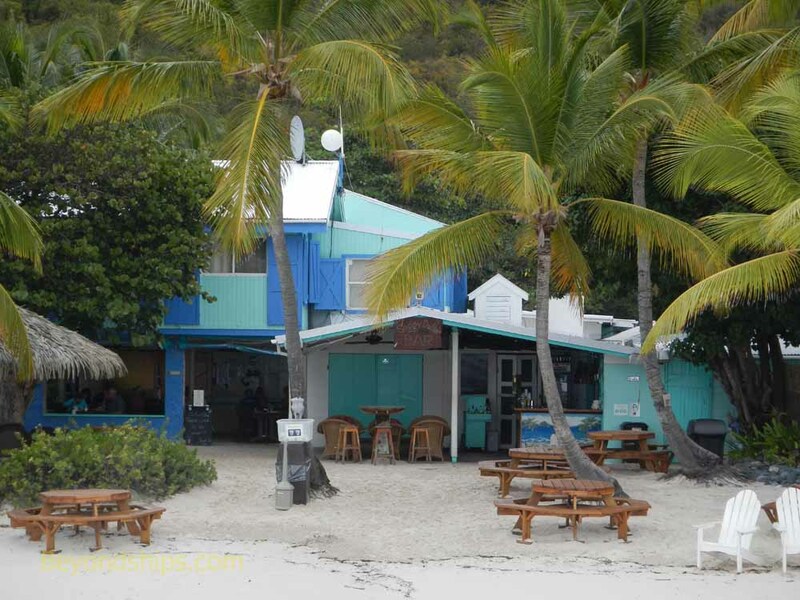 The most famous of these establishments, the Soggy Dollar, allowed us to use its beach chairs free of charge. 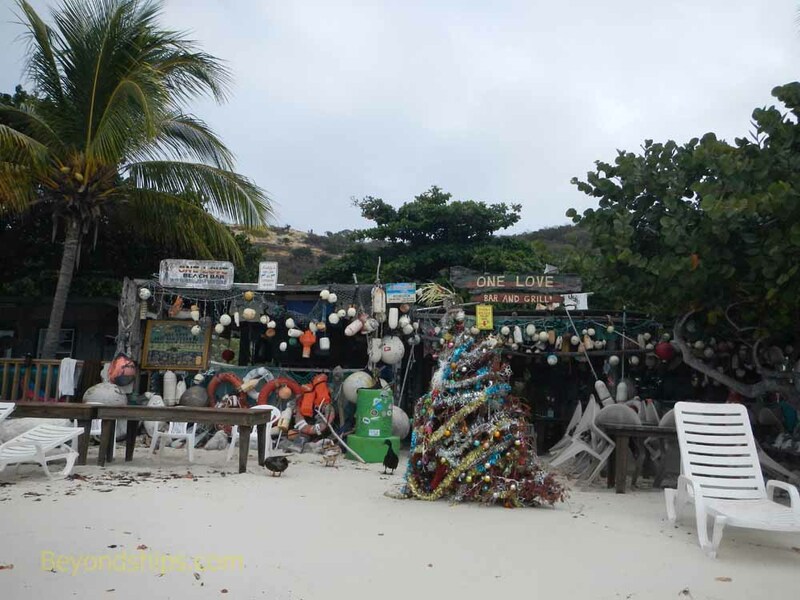 The name of the bar is said to reflect the fact that quite a few of the customers are boaters who swim ashore and pay for their drinks with wet money. Many of the people on our tour patronized the bar during the course of our stay, buying drinks and food. The specialty of the house is a drink called the “Painkiller.” It is made with dark rum, cream of coconut, orange juice and pineapple juice with shavings of Grenadian nutmeg. ​Below: The One Love Bar. We spent about three and a half hours at White Bay. After letting us off, Rebel Yell returned to the cruise ship pier for another group of guests. It then anchored in the bay until it was time for our group to leave. On the return trip, the crew - - all of whom were friendly - - served complimentary rum punch. A rain shower engulfed the boat en route but the guests' spirits remained high. Afterall, it was a warm day and during a day at the beach, you expect to get wet.